I have been working on two distinctly different projects with two very different teams, for two entirely different organizations. (did you catch how many times I said different?) Since we are still in the planning stages of one of the projects, I will focus my musings on the planning stage, and specifically the work breakdown structure. Please keep in mind that everything that follows is both my opinion (while based on best practices) and my experience. I do not think that I am overstating when I say that I have worked on, contributed to, completed at least 200 work breakdown sessions so far. Work breakdown sessions are tough, filled with exploration and uncertainty, and usually do not immediately result in a project plan. In most cases, the participants have little or no previous experience doing work breakdown structures so there is a huge learning curve for everyone involved. I see the work breakdown planning session as a major “brain dump” that requires shaping and fine tuning before it can be turned into a project plan. My preference with work breakdown structures is to review the project and project deliverables with the team. I give everyone post-its®*, pens and ask them to write all the tasks and activities required to complete the project deliverables. I urge the team to write all the activities and tasks , not just the ones that they will be performing. At this stage of the process, there is no editing. It is completely free flow. 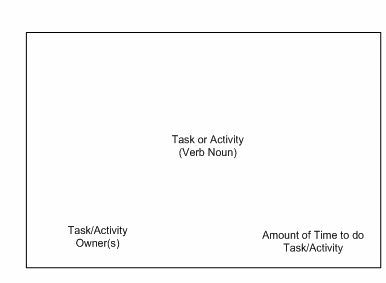 I do recommend that each post-it® contain at least the task or activity name, the task or activity owner(s) (the role that will be performing the task or activity, can be more than one person or group) and the time needed to perform the task or activity. If the amount of time is different from the duration, I recommend using both. See figure 1 – for an example of the recommended post-it® layout. As the team finishes writing down the activities and tasks, I ask them to start arranging them on the wall. As the team members start to put their tasks on the wall, they start seeing patterns and grouping things together. Seeing tasks usually reminds them of other tasks, so they create post-its® for those tasks. The beauty of the post-it® method is that it is non-linear and allows the team to see the whole picture, not just their own activities and tasks. They start to see dependencies and relationships. The team works as a group to create order out of chaos. Similar post-its® are grouped together reflecting dependencies and relationships. Categories of work begin to become clear. *this is not an advertisement for post-its®. At this point in time, I do not advertise or accept advertising of any kind on this blog. I have no affiliation with 3M or post-its®, I simply love the product (all the shapes and sizes) and use them regularly. When I mention products or services by name, it is because I use/buy them. I buy them with my own hard-earned money.